Was cumulative effect of subconcussive blows to blame? (BOSTON) - An autopsy has revealed that former NHL star Rick Martin was suffering from Chronic Traumatic Encephalopathy (CTE) , a neurodegenerative disease linked to repeated brain trauma, when he died at age 59 of a heart attack in March 2010. All three former NHL players to have their brains studied post-mortem at the Boston University Center for the Study of Chronic Traumatic Encephalopathy (CSTE) have now been shown to be suffering from CTE, but Martin is the first who did not play an "enforcer" role and regularly participate in on-ice fights. Martin, a seven-time All-Star in an 11-season NHL career, mostly with the Buffalo Sabres, was diagnosed with CTE by neuropathologist and CSTE co-director Ann McKee, MD. CTE can only be diagnosed by examining brain tissue post-mortem. Dr. McKee had previously diagnosed former NHL players Bob Probert and Reggie Fleming with CTE. Probert died at the age of 45 from heart disease. Fleming suffered from dementia when he died in 2009 at age of 73 after 30 years of progressive behavioral and cognitive difficulties. Martin had stage 2 of 4 (4 being the most severe) of the disease, a stage unlikely to significantly affect his cognitive abilities or behavior. Martin did not suffer known brain trauma outside of hockey, did not engage in fighting, and his only known concussion occurred in a game in 1978 when his head hit the ice while not wearing a helmet, causing immediate convulsions. Martin only wore a helmet he played after that injury. C.T.E. symptoms can include memory loss, depression and a lack of impulse control. "Rick Martin's case shows us that even hockey players who don't engage in fighting are at risk for CTE, likely because of the repetitive brain trauma players receive throughout their career," said Boston University CSTE co-director and Sports Legacy Institute co-founder and CEO Chris Nowinski . "We hope the decision makers at all levels of hockey consider this finding as they continue to make adjustments to hockey to make the game safer for participants." "It is scientifically interesting that Mr. Martin only had stage 2 disease at 59 years old, as by that age most cases in our brain bank have advanced to stage 3 or 4. There are a number of variables that we don't yet understand that could account for this finding, such as lower lifetime exposure to brain trauma, later onset of the disease, genetic risk factors, among others," said Robert Cantu, MD, a leading concussion expert and a CSTE co-director. Research at the BU CSTE is currently underway to further understand the risk factors for CSTE. "We believe that repetitive brain trauma is a necessary factor for developing the disease, but not a sufficient factor. We now must learn why some people get the disease and others don't and why CTE progresses more quickly and severely in some individuals than in others," said Robert Stern, PhD, a CSTE co-director. Of the 96 brains in the CSTE's bank, McKee has completed the analysis of over 70 former athletes, with more than 50 having shown signs of CTE, including 14 of 15 former NFL players, as well as college and high school football players, hockey players, professional wrestlers and boxers. More than 500 living athletes have committed to donate their brain to the BU CSTE after death, including over a dozen former hockey players. Autopsy results on the brain of NHL player Derek Boogaard, who died earlier this year at 28 years old, are pending. While the details of Martin's brain tissue analysis were not released, pending submission to an academic medical journal, his family requested that the diagnosis be made public at this time, in the belief that Martin would have wanted to raise awareness of the dangers of brain trauma in sports and encourage greater efforts to make sports safer for the brain. The autopsies, as well as research recently conducted at Purdue University, provide further evidence to suggest that repeated subconcussive (blows to the head that do not result in a diagnosed concussion) can have adverse short-term and long-term effects on the brain, prompting Dr. Cantu, for one, to recommend that youth athletes delay playing collision or contact sports  under current rules. The announcement also came as the N.H.L. 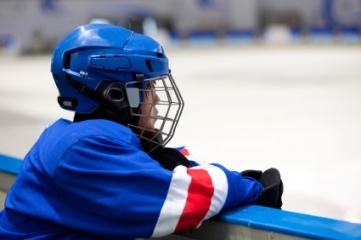 is further strengthening its ban on hits that cause concussions, and just months after both USA Hockey and hockey's governing body in Canada extended a ban on head contact in youth hockey down to the Pee Wee level. An autopsy has revealed that former NHL star Rick Martin was suffering from Chronic Traumatic Encephalopathy (CTE), a neurodegenerative disease linked to repeated brain trauma.